In early February 2019, Jennifer Aniston had a milestone birthday, but the Dumplin' star wasn't sweating turning 50. According to an alleged insider who spoke to Us Weekly, the actress "feels like life gets better with age and she isn't looking back." Who would if you've managed to build a reported $200 million net worth and your best friends are some of Hollywood's biggest stars? Aniston's 50th birthday bash at the Sunset Tower Hotel was like the Oscars of birthdays. The guest list was pretty much as impressive as the royal wedding. In fact, the star power was so unbelievable, we'd be shocked if guests didn't get $30k swag bags on their way out (because that's a real thing that allegedly happened the following night the Grammy Awards, which was arguably less eventful). Diane Keaton showed up. Amal and George Clooney showed up. Jason Bateman was there. Demi Moore, Isla Fisher, Sacha Baron Cohen, Barbra Streisand, and Jimmy Kimmel (who appeared to designated drive) were all in attendance. Even Aniston's infamous ex Brad Pitt made an appearance. So, what really went down at Aniston's birthday (beyond our invitations clearly being lost in the mail)? The celebration was shockingly under wraps. Jenifer Aniston opted to throw her 50th birthday bash at the Sunset Tower Hotel (above right). The swanky West Hollywood hotspot has been kicking since 1929, but was renovated in 2018. Today, it's still known for its Art Deco style. Think: The Great Gatsby, but the version that stars Leonardo DiCaprio, who might have been the only celebrity that didn't actually show up the party despite the fact Aniston went to his birthday the year prior. According to Luxury Travel Advisor, Truman Capote once called the Sunset Tower a place where "every scandal that ever happened, happened." John Wayne reportedly "kept a pet cow on the balcony," someone at some point in time paid $14 for a side of seasonal fruit, and it might actually be haunted. There's been a lot of drama there over the years, so it kind of makes the perfect setting for Aniston, a celeb whose media coverage has unfairly centered around her relationship issues, to throw the most epic party of 2019. Girl, 50 looks good on you. Though the guest-list for Jenifer Aniston's birthday party was beyond impressive, you know everyone was waiting to see whether or not a Friends reunion would actually happen. Rest assured: it did, just without the choppy '90s haircut (Aniston reportedly never liked "the Rachel" anyway). Both Courteney Cox and Lisa Kudrow showed up to celebrate alongside their longtime friend. According to E! News, Aniston has maintained a super-close friendship with Courteney Cox since starring in the famed NBC sitcom. They've supported each other through career-wins (remember Aniston's Cougar Town cameo), breakups (most poignantly, Aniston's two high profile divorces) and birthdays galore. But less than a week before Aniston's golden celebration, rumors surfaced about a feud between the BFFs. According to Radar Online, the Dumplin' actress was "stabbed in the back" when Cox and Kudrow made plans to do a TV series without her. The news was reportedly going to "hit Aniston like a wrecking ball," though the wrecking ball might have been CGI because the star hardly seemed phased. 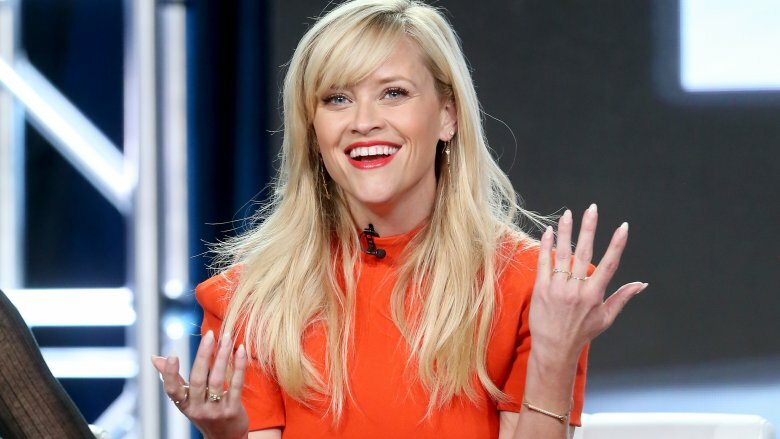 She hasn't really chosen to work in the world of TV since Friends and has a new Apple series in the works with Reese Witherspoon and Steve Carell. In other news, David Schwimmer was not at Aniston's party from what we can tell, but they may just be on a break. Jenifer Aniston and Brad Pitt had one of the most infamous divorces in celebrity history. According to Cosmopolitan, the stars tied the knot in 2000, but called it quits in 2005 as rumors about Pitt's relationship with Angelina Jolie made headlines. Pitt went on to marry and split from Jolie (the New York Post printed a photo of Aniston laughing when the divorce filing went public in 2016). Aniston went on to marry and divorce Justin Theroux. As of this writing, the universe seems to have finally re-aligned. In the very least, all the relationship drama is water under the bridge. According to In Touch (via Independent.ie), Pitt offered his former flame an apology more than a decade after their breakup. E! News reported that the pair "text once in a while." With their respective divorces, it seems like the exes might have a lot to talk about — which could be the reason Aniston waffled on his invite. After all, is your b-day the kind of occasion to commiserate about something like that? According to People, Aniston's party was filled with "every single person who loves" the actress, but she "debated back and forth with friends" if her ex-husband should get an invite. Ultimately, she ended up extending the offer, triggering rumors of a rekindled romance (though we seriously doubt that's the case). There are some things from the early '00s none of us actually need to come back — frosted tips, clothing inexplicably made out of PVC, bedazzled denim. For Jenifer Aniston and Brad Pitt, their relationship may just fall into that category. According to People, "They've been over each other for longer than they were ever together." Nonetheless, Pitt did wind up attending his exe's 50th birthday bash. Unlike their headlines from the last 15 years, things were apparently very drama-free between the two exes. Entertainment Tonight reported that Pitt accepted the invitation because he "wanted to support" his former flame and they've "been friendly." The former couple didn't end up spending a lot of time together at the event beyond a brief chat and friendly hug. People reports that Aniston was "happy that he showed up," but she "didn't pay any special attention" to him. Pitt ended up spending the majority of his time hanging out with George Clooney and Orlando Bloom, while Aniston took care of her other guests. All in all, he didn't even stay very long, and worked with security to leave the party unnoticed. Sorry, nothing to look at here. 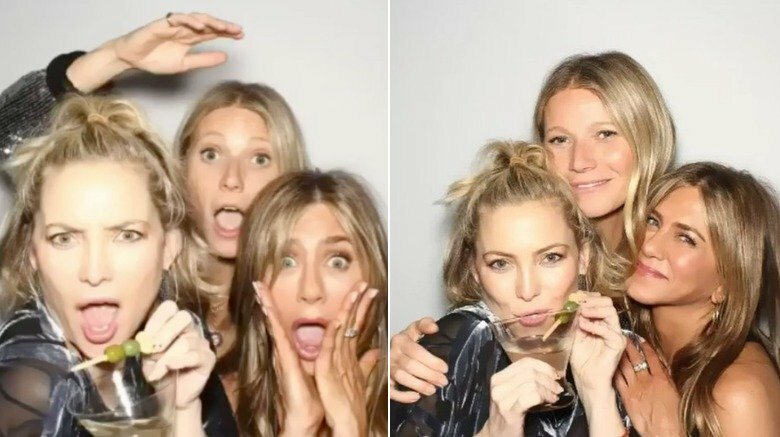 It's pretty much a rule that all good parties have a photo booth — and Aniston's 50th birthday bash was obviously a really, really good party. Needless to say, its photo booth was filled with enough beautiful celebrities to rival New York Fashion Week, which was happening simultaneously on the opposite coast. If there was one photo booth champion beyond Aniston (who obviously wins the crown because she paid for the photo booth in the first place), it's Goop founder and yoni egg queen Gwyneth Paltrow. 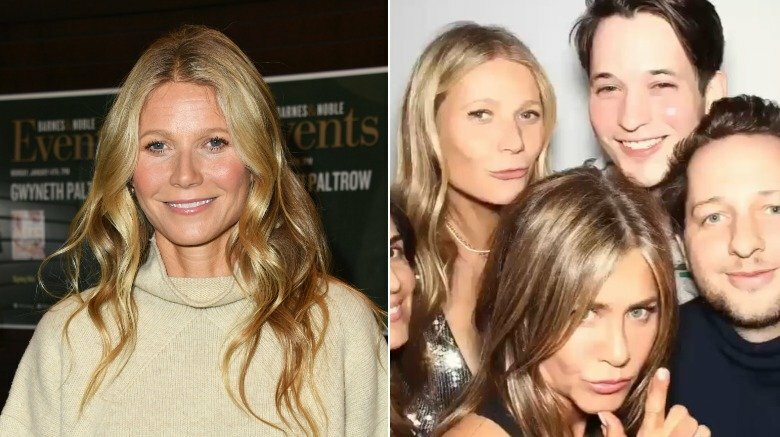 The star was caught in a couple photo sessions that give us serious FOMO and make us reconsider all those bizarre Goop beauty tips because she — and all of her friends — look absolutely ageless. Can we talk about the pureness of the smiles shared in the shots with Kate Hudson? Can we get one of those martinis? Paltrow continued Aniston's birthday festivities by sharing a second photo booth gif on Instagram along with a sweet message to the birthday girl, calling her "our ray of sunshine" and an "example of perpetual goodness." Paltrow added, "We love you so much and you make 50 look [fire emoji]." It's impossible to disagree. Absolutely no one needs their bestie accidentally sharing a photo of them dancing like a drunken idiot on their birthday. We know that's what Instagram stories are for, but even the most high-profile people deserve one day a year without the fear of public embarrassment. 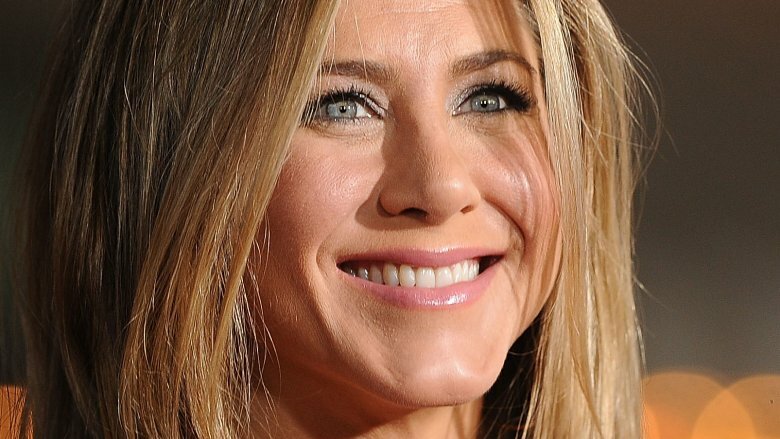 Enter: Jennifer Aniston's social media ban. The former Friends actress reportedly asked her party guests to lock up their social media accounts tighter than ADX (for those of you unfamiliar, that's the country's highest-security federal prison). Aniston must have some really great friends because it seems like almost everyone obliged. We've barely seen more than a few snaps, and each one was from the party's photo booth. According to Today, Katy Perry was the one who gave the no-share rule away. Kate Hudson, who posed alongside Aniston and Gwyneth Paltrow while drinking a martini, shared a couple of the photo booth snaps on Instagram. Perry came to Aniston's defense and commented, "NO SOCIAL MEDIA." Thankfully, Hudson had gotten "permish." Aniston's exclusive guest list also included Dolly Parton, who tried her best to make the event. It's not clear if she actually showed up, but the country legend seemed busy with Grammy duties. She was slated to perform with her goddaughter, Miley Cyrus, at the awards show the following night. 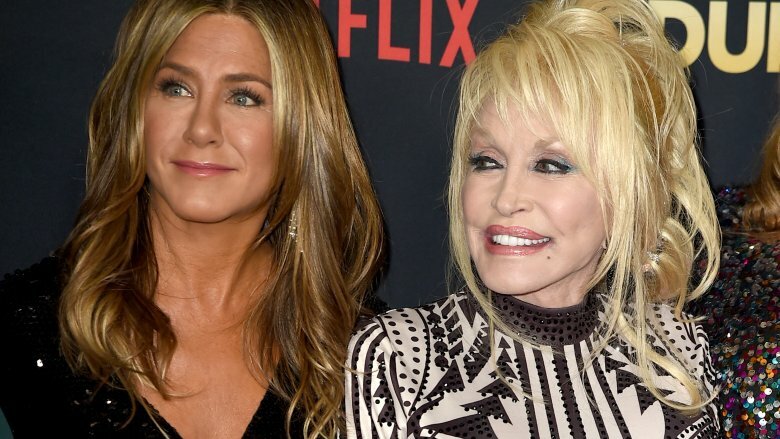 In an interview with Entertainment Tonight, Parton, who worked with Aniston on the Netflix flick Dumplin', admitted she hadn't yet bought a birthday gift for the star. In lieu of a present, she planned to "go to her house and eat her food and drink her wine and say 'Happy Birthday!'" "I don't have time to get her a present. I'm busy," she said, adding, "No, I'll think of something." To be honest, hanging out with Dolly Parton seems like enough of a present for anyone, but could we maybe get some free tickets to Dollywood, too? For everyone still hoping the angel that is Katy Perry never ever gets back together with John Mayer and his smart-casual pajama pants, fear not. 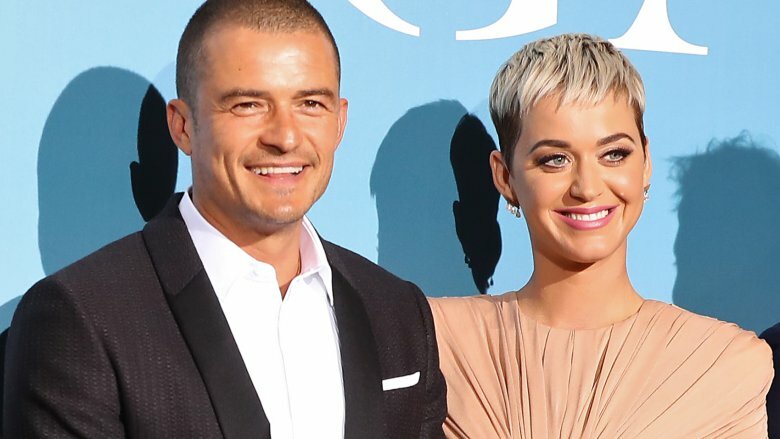 She's still going strong with Orlando Bloom, after reigniting the spark in late April 2018. The couple was just two of Aniston's A-list guests. According to the Daily Mail, Perry and Bloom made quite the entrance to the Sunset Towers Hotel. Instead of riding in on a pirate ship (because we're never letting go of Pirates of the Caribbean), the pair opted for a motorbike. Perry was reportedly spotted "snuggling up close" to her Sindarin Elven love before heading inside. The singer was absolutely dressed for the occasion in a head-to-toe PVC jumpsuit look. We're hoping the weather was on the chillier side for California because sweating in plastic clothing is never in style. She iced herself with some bedazzled sneakers, while Bloom opted for denim, a much more breathable, sensible fabric. Poor Reese Witherspoon. Aniston's social media ban didn't prevent the paps from catching the Legally Blonde star's most embarrassing moment of the night. Witherspoon, who's working with Aniston on an Apple TV series, strutted out of the Sunset Tower Hotel in towering heels. Unfortunately, those kind of kicks are tricky when you're dealing with gravity. In a video captured by the Daily Mail, the Big Little Lies actress was spotted tumbling down the stairs as she made a swift exit. She grabbed a glass handrail in an attempt to stabilize herself, but it was too late. She had already fallen to her knees, giving bend and snap a whole new meaning. Though The Mail speculated that Witherspoon had a bit too many cocktails, who wouldn't lose their balance in platforms that high? As soon as the star took the tumble, she was met by a hotel worker who comforted her in her time of need. Basically, she's lucky she didn't twist her ankle. The star got right back up and headed to her car with little more than a bruised ego (at least that we know of). Sandra Bullock doesn't generate a ton of tabloid headlines, but when she does, they're memorable. When the star isn't getting baby foreskin zapped into her face in what has to be the world's most bizarre facial, she's kick-starting dangerous viral memes. All in a day's work for an Oscar winner, right? The star ended up taking the night off for Aniston's 50th birthday bash and brought her boyfriend Bryan Randall as her plus one. Bullock and Randall have a notoriously low-key relationship. They pair linked up in 2015 and have been so private that fans are left with little more than fake stories about their alleged secret marriage. Well, the good news is, they appear to be as strong as ever. According to Hollywood Life, the couple "flaunted some PDA" outside of the hotel. Just how hot and heavy did it get? "They were seen holding hands" with their fingers linked — Whoa! Get a room, you two! Aniston's 50th birthday bash was certainly a party for the ages, but she might have another celebration on the horizon. Ellen DeGeneres, who showed up to support her pal on the big night, announced on Twitter that she'd be throwing the former Friends star a birthday party on-air in February. Aniston appeared on DeGeneres' talk show in early December 2018. At that point, the actress didn't have any plans to celebrate her golden jubilee year (in other words, she ended up throwing the best party of 2019 in just a month, which is pretty impressive). The talk show host promised the Dumplin' actress that they'd do a party for her on the show. "What if we have your birthday here, for the whole hour, we celebrate you? I mean it," DeGeneres said (via The Huffington Post). 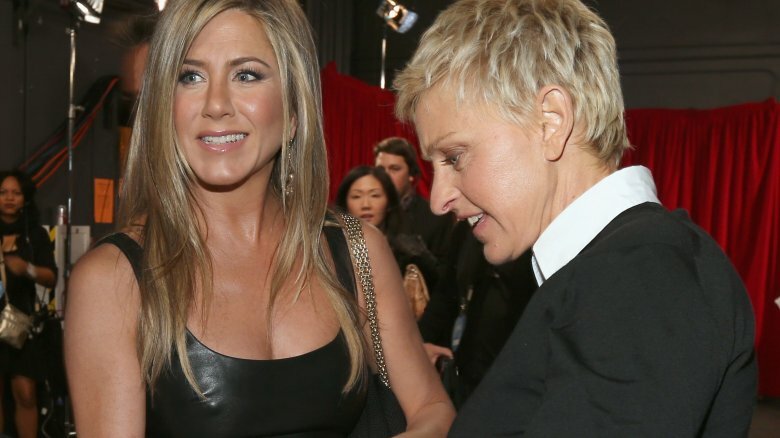 Aniston agreed with the conditions that DeGeneres would throw the after party at her house. There's no word on if Aniston will actually visit The Ellen DeGeneres Show to celebrate the big five-o, but we're still holding out. Such a big milestone definitely deserves two parties.